"Jane Kennedy is an impeccable technician with the most thorough knowledge of vocal physiology that I have come across. As a teacher, however she never focuses on this to the point where it might restrict the singer. There is always a reminder to balance the growing technique with the joy of singing, the heart and soul of expressing oneself through music. Her passion for music and for her work is so palpable that each lesson becomes like an adventure--a shared hour of inspiration! After years of feeling rather stuck as far as my voice and my potential to "improve" were concerned, Jane helped me to open myself up to take risks and most importantly to trust myself. She has a remarkable gift for tailoring her approach to the individual singer and empowering that singer. I'm so very grateful to have found her." 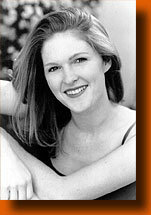 Raissa Dorff studied voice with teachers at the Curtis Institute and the Cincinnati Conservatory before her arrival in New York City and her work with Jane Kennedy. She holds a Bachelor of Music degree in Voice Performance from Catholic University of America. Christine in Phantom (Yeston/Kopit); Amalia in She Loves Me; Fiona in Brigadoon; The Lead Singer in The Wonderful Words of Sammy Cahn; Fiordiligi in Cosi fan Tutte; Zerlina in Don Giovanni and Martha in La Voix Humaine. Raissa has appeared in concert at the Academy of Music in Philadelphia and taught Master Classes in Dramatic Song Interpretation at the Washington Opera. I have found that the approach of positive reinforcement of the good aspects of what is already present in one's singing can create a foundation or backdrop upon which the new ideas and corrections can be presented. This allows a sense of the integration of new information and skill added to the already established correct concepts and sensations that the singer has been using to the point at which they seek my help. Thus there is no disruption or break down in their ability to function. This can be particularly important when career level singers with varying degrees of vocal distress find their way to me for insight. The necessity of continuity of functioning in order to fulfill performance schedules must not be disrupted while changes are being processed. I always inform prospective students when they contact me for the possibility of study that if I am the right teacher for them they will know in the first lesson. There should be immediate improvement felt when the correct information is communicated in a way that guides the singer to the experience of the changes required. The concepts and mechanistic habits that are creating imbalance in the singing process reveal themselves easily in a safe, knowledgeable and nurturing environment. The answer is always present at the root of the question. The solution becomes obvious when the problem is accurately diagnosed.